1. Remove the central rib and shred the washed kale finely (it should resemble the shredded crinkly paper used in packaging). 2. Place a large shallow bowl lined with a few layers of kitchen roll next to the wok/pan of oil. 3. Heat the oil and deep fry the shredded kale in small batches until it's crispy. 4. Drain on the kitchen paper, then transfer to another bowl and toss with sea salt and brown sugar. Method: 1. Combine the chickpeas and vinegar in a medium sized pan. Season with the sea salt. Bring to the boil and remove from the heat. Let the chickpeas sit in the pot for 30 minutes. 2. Preheat the oven to 200°C. Drain the chickpeas and place on a baking sheet lined with greaseproof paper. 3. 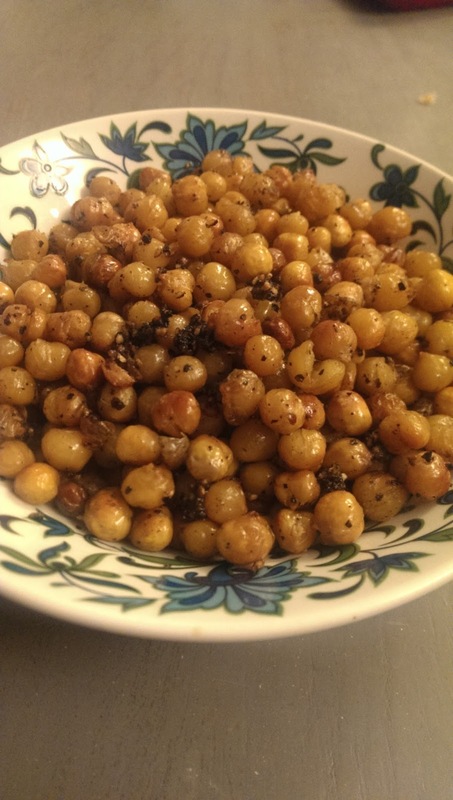 Drizzle with olive oil and sea salt and mix gently to ensure each chickpea is fully coated. Roast for 30-40 minutes, flipping once half way through. Make sure you check them after 25 minutes of cooking to make sure they don’t burn - you want them to be a nice golden colour and be lovely and crispy. 1. Mix all the curry mayonnaise ingredients together and adjust seasoning to taste. 2. To put together: cut the Baby Gem into portion size pieces and top with a slice of smoked chicken, spoon over a teaspoon of curry mayonnaise, a cashew nut and a sprig of coriander. 1. Cook rice in salted water until slightly overcooked and sticky, strain but do not rinse. Add rice vinegar and allow to cool. 2. Thinly slice vegetables into long strips. 3. Spread rice onto sushi leaf. Place a little wasabi and vegetables in a line across the length of the sushi leaf. Roll up tightly and wrap tightly in cling film before chilling. 4. Cut into 2cm pieces and serve with a little soy sauce on the side. 1. To toast the sesame seeds, put them directly into a dry frying pan and dry fry gently until golden in colour. Beware, they burn very quickly! 2. Toss them into the grated vegetables and dress with the dressing when ready to serve. 1. Put the chopped herbs and chilli in a bowl and sprinkle the sugar over them. 2. Mix in all other ingredients and combine with a fork until ready to use.